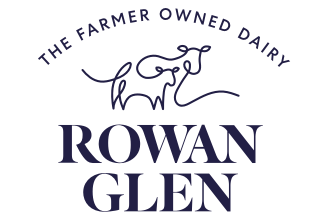 It all starts with Rowan Glen’s special mix of milk and proteins. We pasteurise at 55-65 degrees celsius and homogenise to make sure our yogurt is safe to eat and perfectly smooth. We then add starter cultures and heat to create the perfect yogurt base. We cool the yogurt to 18 degrees celsius and stir continuously. It’s time for the delicious fruit mix to be blended into our yogurt. We then fill the yogurt into pots. It is now ready for delivery to your local store. Our delicious Rowan Glen yogurt, fresh from the fridge – ready for you to enjoy.